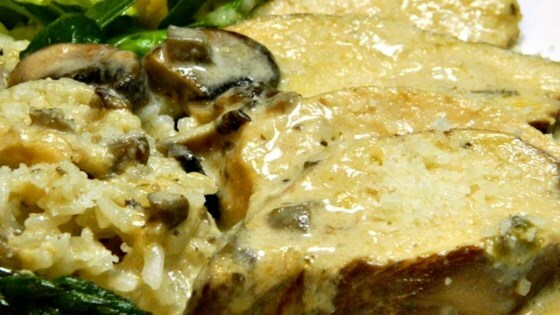 "Very rich and creamy white wine and cheese sauce on chicken breasts. Wonderful family-favorite we have for Christmas dinner every year. Serve over cooked white rice." Combine cream of mushroom soup, Cheddar cheese, and half-and-half in a saucepan; bring to a boil, stirring often. Remove saucepan from heat and stir white wine and mayonnaise, a little at a time, into soup mixture, stirring after each addition until white sauce is smooth. Arrange chicken breasts side-by-side in a shallow baking dish. Pour white sauce over chicken and top with Parmesan cheese. Bake in the preheated oven until bubbling and chicken is warmed, about 45 minutes. This can be refrigerated or frozen before cooking. This sauce was insanely delicious. I served mine with steamed broccoli and cauliflower, with the sauce over the top. It was to die for! Absolutely delicious! I just added a little Truffle salt (OMG, it gave it an amazing aroma and taste), and used heavy cream instead of half and half. Otherwise, just the same. It was sooo good! Fantastic. Simple. Added nutmeg & white pepper. Didn't have cream-used milk. Worked fine. Thank you. It came out like nice sauces we have had in restaurants! Delicious...didn't have any wine so substituted with chicken broth...my picky 5 yr. old couldn't eat enough! Thanks for posting!! we love this!! just enough of a boozy wine taste and still rich and creamy. yumm. This sauce would make a dirty wet sock taste delicious. I like recipes that are relatively easy and don't have a bunch of ingredients. I served this with some risotto.